All bookings require a signed contract and a 50% deposit. Visit the Booking FAQ page or contact me for more information. I played my first wedding ceremony in the summer of 1996, and have been performing for weddings & events frequently since then. 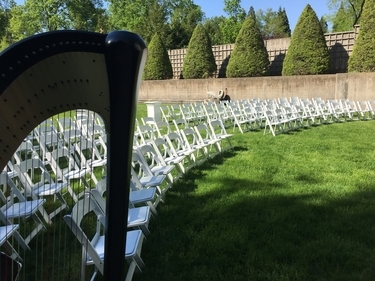 Being a wedding harpist has been my full-time job since 2004. How many weddings have you played for? As of the end of 2016, the number was well over 600! Do you have references from other couples? Yes! Please check my Testimonials page. Wedding pricing is based on your wedding date and location. Off-peak discounts are available. Please contact me for a customized quote! You may pay your deposit and balance payment by personal check, money order, cash, or Paypal. Yes, all events require a non-refundable 50% deposit to secure your date and time. The deposit must be submitted with your signed contract. The balance is due no less than 30 days prior to your wedding. If you are booking your wedding less than 30 days in advance, the full balance is due with your contract. Can we hear you in person before booking? I have a limited number of public events on my calendar, which you are welcome to attend before booking. Please check my Upcoming Events page or contact me for the current listing. As weddings are private events, I do not invite prospective couples to these occasions. Several performance samples are available on the Audio Clips and Videos pages, and I'm happy to play anything in my repertoire for you over the phone. What types of weddings do you play? I am happy to provide music for traditional and non-traditional ceremonies. I have experience with all Christian denominations, Catholic Masses, Jewish services, Baha'i ceremonies, Hindu ceremonies and sangeets, and non-religious weddings. Do you play for outdoor wedding ceremonies? 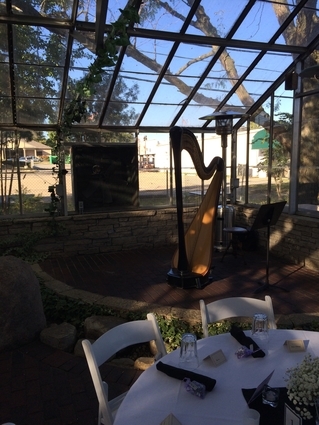 Yes, I am happy to play outside, as long as the weather cooperates and the harp is protected from the elements and placed in the shade. All outdoor weddings require a back-up location to be available and used in case of inclement weather. Will you play on the beach? Yes! All beach weddings are performed on the Laurel Leaf lever harp or the BlevinSong lever harp. 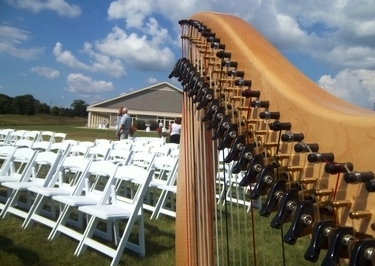 The BlevinSong harp can be raised on legs and placed directly on the sand. This is the harp that flies with me for all destination weddings. 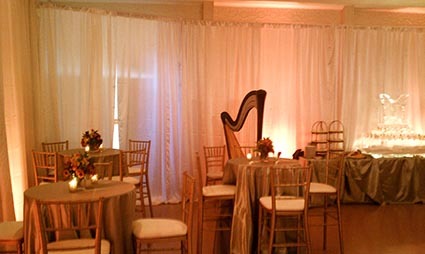 To have the Laurel Leaf harp, you need to provide a solid surface (such as a section of dance floor, plywood, or a folded card table) on which to place the harp. Some form of shade is also required (a large beach umbrella works well). Although most of my weddings are in the Midwest, I am available anywhere in the US and internationally for destination weddings. Please contact me for details! Where should we have the harp set up? The harp needs a dry, flat & level space of about four feet square. For outdoor events, it must be set up in the shade. From the set-up location, I need to be able to see the front & back of the aisle when the bridal party is standing in place. Do we have to provide you with anything for set-up? No, I provide my own harp, bench, stand and amplifier (as needed), but will use a chair provided by your venue if you prefer. Will I be able to hear the harp? The sound of the harp carries very well. For most ceremonies, amplification is not needed. The only exceptions would be for venues that have noise issues such as being outdoors on a busy street, near a large waterfall or fountain, or close to an airport. Large guest lists may also require amplification if the guests will be spread over a large area (mostly applies to outdoor events). Please ask me if you believe your ceremony may require amplification. What do you wear for weddings? It is your choice – either in colors to coordinate with your wedding party or in concert black. I can also dress to match your theme (Renaissance, beach, Halloween, etc.). Can you provide duets or other ensembles? If you don't see the group in which you are interested listed, please contact me with your ideas – I'd be glad to put together a unique grouping just for you! Generally, no. Before your wedding, I will discuss all of the music selections and the	logistics of your ceremony. I use this information to time the processionals properly, and do not need to attend the rehearsal. It is my job to make the music fit whatever happens – you do not need to time the processional to match the length of the song. As needed, I can lengthen or shorten any piece to accommodate the size of the bridal party and the length of the aisle. On your wedding date, I always arrive in plenty of time to go over any last-minute changes with your planner or officiant. I am also happy to speak with them in advance to go over any of their requirements. If you or your officiant require my attendance at the rehearsal, it is charged at my regular hourly rate. Depending upon the distance from my home, overnight accommodations may also be required. What types of music can you play on the harp? The harp is very versatile! Along with traditional wedding music and familiar classical pieces (Baroque, Classical, Romantic, & Modern), I also play Celtic, jazz, Broadway, rock, popular, sacred/religious, Bollywood, Jewish, holiday, Christmas, Renaissance, and folk music. You can view my extensive Repertoire List for specific pieces and sound clips. What music is included in a wedding ceremony booking? All ceremonies consist of five basic elements. The prelude is background music for guest arrival. I begin to play fifteen minutes prior to your ceremony's start time to welcome guests to your venue. All processionals are included, for the famlies, wedding party, and bride, as well as unlimited selections during the ceremony itself (unity candle/sand, rose ceremony, instrumental solo, communion/eucharist, etc.). All ceremonies include a recessional selection as the couple & wedding party exit the ceremony, and then fifteen minutes of postlude music as your guests depart. How many pieces do I need to select for my ceremony? For the prelude & postlude, you may select a genre of music, such as classical, Celtic, sacred, or popular. I will fill in with pieces that fit your theme. You may have up to three processionals - one each for family seating, wedding party, and the bride. Some couples choose to have family seating as part of the prelude or to the same piece as the wedding party. You may also have music for a unity candle, unity sand, handfasting, rose presentation, an instrumental interlude, or other special moment during the ceremony. Check with your officiant if you are unsure if mid-ceremony music will be needed during your wedding. You will also choose one piece for the recessional as the wedding party exits. What songs can I pick for my ceremony? You can make your choices from the complete Repertoire List (or view my most popular wedding music requests). If you would like me to play a piece that is not already a part of my repertoire, I can usually accommodate you, with advance notice. There is a fee for purchase of sheet music, arranging it for the harp, and learning your special piece to performance standard. I am having a full Catholic Mass. Can you provide all of the necessary music? Yes! A full Mass requires the booking of additional time due to the longer and more	involved ceremony. All of the Mass music is included in this booking, as is music for the offertory, sign of the peace, communion, and rose presentation. If you are having a cantor, please have him or her provide me with the responsorial psalm and any solos in the appropriate key. I will arrange a rehearsal with your cantor prior to your ceremony. 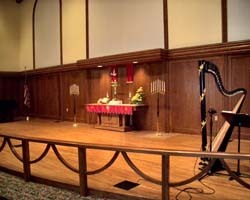 Read more about Catholic wedding music on the harp. What music is most traditional for a wedding ceremony? For the entrance of the bridal party, "Canon in D" by Pachelbel and "Jesu, Joy of Man's Desiring" are popular selections. "Canon in D" is also frequently used for a bridal processional, as is the more traditional "Bridal Chorus" – also known as "Here Comes the Bride" - by Wagner. For the recessional, Mendelssohn's "Wedding March" is the most traditional choice. "Trumpet Tune" and "Trumpet Voluntary" are other classical pieces frequently used for the recessional. As my complete repertoire lists are long, I have made a smaller list of my most popular wedding music, so that is a good place to start your music search. Do I have to have traditional music? Not at all! I love working with couples to create a musical soundtrack that is unique and perfectly reflects their tastes and vision for their wedding. Some of the more memorable pieces that brides & grooms have chosen include Bend Folds' "The Luckiest", "Throne Room" from Star Wars Episode IV, and "Take Me Out to the Ball Game." The music should be something that has meaning to you and your families, and that can come from any genre. Be sure to check with your officiant and venue (if in a house of worship) to see if there are any restrictions on your music choices, as some do not allow non-classical or non-sacred music. There is a song I'd really like played that isn't on your repertoire list. Can you learn it for my wedding? The answer is almost always "yes"! As long as sheet music is available (either for piano or harp), it can be performed successfully on the harp, and I have enough notice to learn it to performance standards, it can be done. The cost is $25-$75 per song, depending upon complexity and the cost of the sheet music. If sheet music is not available, you can have the music professionally transcribed from a recording. The cost of this ranges from $150-300, depending upon length, and is in addition to my fee for my learning the piece. Will you accompany my musical friends or family members as they play or sing? As long as your friend or family member is a trained musician who will be comfortable performing for your guests, this is no problem at all! At least one additional rehearsal will be required, at the rate of $50 per hour. This rehearsal will take place in my studio, via FaceTime or Skype, or at your ceremony venue the day of your wedding. Will we meet with you before the wedding day? In most instances, it is not necessary. Unlimited phone, email, text, FaceTime, and Skype consultations are included with every booking. An in-person consultation can be helpful if you are unsure of what music you'd like to have for your wedding and want the opportunity to hear more options before making your selections. The rate is $50 per hour in my studio. Consultations outside my studio are charged my hourly rate plus mileage. Can you also provide music for the reception? Yes! You can receive discounted reception music with your ceremony booking. 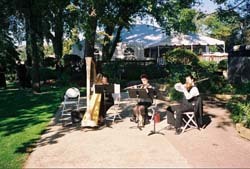 It is most common to use harp music for the cocktail and dinner hours. I provide amplification at no additional charge, or can plug into your venue's, DJ's, or band's sound system.